Figure 3-25. 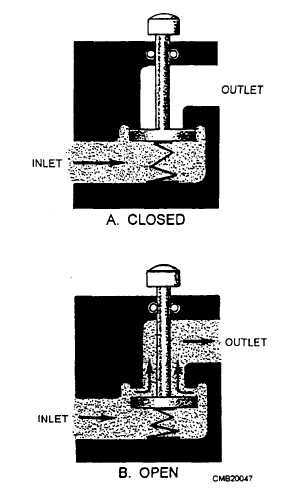 - The basic operation of a simple poppet valve. PISTON-TYPE CYLINDERS. - An actuating cylinder in which the cross-sectional area of the piston is less than one half of the cross-sectional area of the movable element is referred to as a piston-type cylinder. This type of cylinder is normally used for applications that require both push and pull functions. The piston-type cylinder is the most common type used in fluid power systems. The essential parts of a piston-type cylinder are a cylindrical barrel, a piston and rod, end caps, and suitable seals. The end caps are attached to the end of the barrel. These end caps usually contain fluid ports. The end cap on the rod end contains a hole for the piston rod to pass through. Suitable seals are used between the hole and the piston rod to keep fluid from leaking out and to keep dirt and other contaminants from entering the barrel. The opposite end cap of most cylinders is provided with a fitting for securing the actuating cylinder to some structure. This end cap is referred to as the anchor end cap. Figure 3-26. - Operation of a rotary spool valve. The piston rod may extend through either or both ends of the cylinder. The extended end of the rod is normally threaded so that some type of mechanical connector, such as an eyebolt or clevis, and locknut can be attached. This threaded connection provides for adjustment between the rod and the unit to be actuated.